The Law Office of Attorney Andrew A. Caffrey, Jr. has been providing clients in the Andover and surrounding area with sound legal advice since 1977. During this time Attorney Caffrey’s knowledge, integrity and responsiveness have fostered many lasting relationships. 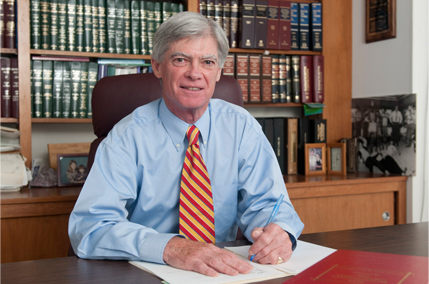 Attorney Caffrey approaches the practice of law more as a profession than as a business. Your interests are valuable and worth protecting. Attorney Caffrey believes that trusting relationships are critical to the legal process. He believes that foresight beats hindsight every time, and is proud to be the first call his clients make when they have a legal question and need competent, knowledgeable advice, in a professional setting. Whether you have questions or need representation for matters of: real estate, civil litigation, estate planning, the administration of wills and trusts, appeals, or personal injury, Attorney Caffrey is ready to handle your case. Your interests are valuable, and worth protecting. He is glad to help. Any unauthorized use of material herein is at the user’s own risk. Transmission of the information and material herein is not intended to create, and receipt does not constitute, an agreement to create an attorney-client relationship with the Law Office of Andrew Caffrey or any member thereof. Contacting the Law Office of Andrew Caffrey does not create an attorney-client relationship. Please do not send any confidential information until such time as an attorney-client relationship has been established.